Dr. Bob McCauley's BLOG - 7 Components of Great Health! My hero Dr. Bernard Jensen wrote a book called the chemistry of man. It is one of the best books explaining how minerals are used in the body. He tells us in there about the major minerals and how their use throughout the body. So I decided to come up with this mnemonic device so we could remember it more easily. The five major minerals are sodium, calcium, iodine, magnesium, and potassium, sodium alkalizes the body. Calcium is for our bones. Iodine is for oxygen. Magnesium is for muscles. Potassium is for the brain. 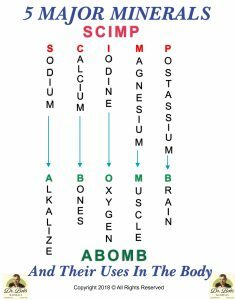 SCIMP and ABOMB. Dr. Bob’s BLOG is covered under Communications Decency Act (47 U.S.C. Â§230),: “No provider or user of an interactive computer service shall be treated as the publisher or speaker of any information provided by another information content provider”. 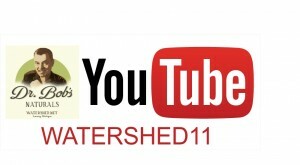 This BLOG contains Copyrighted and Trademarked materials owned by The Watershed Wellness Center. Regarding the templates, pics, video clips, music or other media used in this BLOG. All material is copyrighted to their rightful owners. How Can I Become A Vegetarian? If you want to become a vegan then stop eating meat, fish, eggs and dairy. Replace those with chlorella and spirulina, two types of algae and the most powerful foods in the world. They are 60% protein. Take a small handful ( 10 – 12 tabs) of spirulina and/or chlorella tablets with any meal and that’s all the protein you need for that meal. Period. That’s how to get started. Coca-cola: Not an evil corporation, just misguided. McDonald’s: Not an evil corporation, just misguided. Monsanto: Evil corporation. There are companies that do things that are harmful to people and they know not which they do. And then there are companies that invent things like glyphosate, Roundup, they know exactly what they have and they continue to produce it and poison the world. glyphosate, Roundup is one of the most insidious products ever invented in human history and should be avoided at all costs. The human body sees phosphate and thinks it is glycine. Instead, phosphate is being absorbed into the body as glycine and it is making untold numbers of people sick, ill, disease with every kind of ailment you can think of. Monsanto: evil Corporation. Roundup kills. Roundup is killing people as we speak. Spray that one your dandelions. It has long been said that the definition of insanity is doing the same thing over and over and expecting different results. This sounds to me quite a lot like the pharmaceutical industry which is really no more than around a hundred years old. They started out decades ago trying to cure diseases to science. Anybody who challenges that is accused of standing in the way of progress. The cure for all diseases is found in nature. Why are we looking in the laboratory. 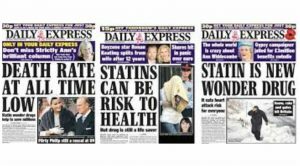 Why are we creating Statin drugs? 20 years ago Stanton drugs were supposed to save the world and cure cancer. Now they have been shown to cause serious side effects, as all drugs do, and now we’re being taken off the market one by one. There are lawsuits going against the manufacturers of Statin drugs. What is the definition of insanity? Take a good long look at the pharmaceutical industry and in there you will find your answers. Acetic acid is the main ingredient in Apple Cider Vinegar that makes it so healthy. The pH of Acetic Acid and Hydrochloric Acid is exactly the same: 2.5. The pH of Apple Cider Vinegar is 5.0. Only consume ACV with the MOTHER. Apple Cider Vinegar has been used for thousands of years as a digestive aid. Hippocrates – the father of medicine – prescribed it as a way to improve health. Acetic acid is the predominant nutrient that gives vinegar its many health benefits. 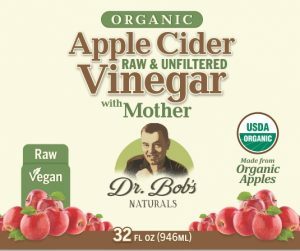 Dr. Bob’s Apple Cider Vinegar improves skin and hair health. It can help relieve acid reflux, gas and bloating. It can even be used as a natural deodorant and relief from sun ravaged skin. Suggested Use: Take 1 TBSP (15mL) pure or mixed with honey, maple syrup, stevia and tea. The blood is NOT an accurate measure of body pH. Our blood’s pH is always 7.25 – 7.45. Body pH can only be measured through the urine. moving average and an accurate measurement of your body’s pH. Hydrochloric acid (gastic acid) helps digest proteins by activating digestive enzymes. 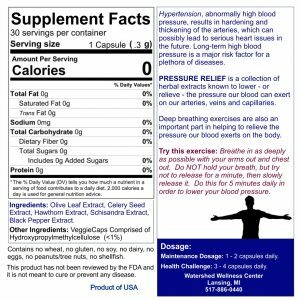 Are the benefits of fish oil a scam? Why eat fish oil when you can get the essential fatty oil from algae they are getting it from. Fish are just a middleman when it comes to nutrients. Hypertension, abnormally high blood pressure, results in hardening and thickening of the arteries, which can possibly lead to serious heart issues in the future. Long-term high blood pressure is a major risk factor for a plethora of diseases. 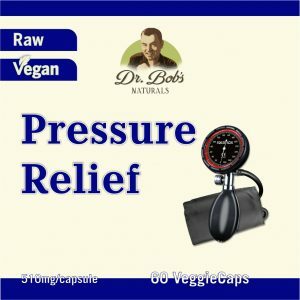 PRESSURE RELIEF is a collection of herbal extracts known to lower – or relieve – the pressure our blood can exert on our arteries, veins and capillaries. Deep breathing exercises are also an important part in helping to relieve the pressure our blood exerts on the body. Try this exercise: Breathe in as deeply as possible with your arms out and chest out. Do NOT hold your breath, but try not to release for a minute, then slowly release it. Do this for 5 minutes daily in order to lower your blood pressure. Ingredients: Olive Leaf Extract, Celery Seed Extract, Hawthorn Extract, Schisandra Extract, Black Pepper Extract. Now you see it oh, now you don’t. The documentary, the root cause, was quietly taken down from Netflix, and other platforms. Quietly is the word that we use to see it go from Netflix, but I’m sure the American Dental Association, ADA, was not quiet in their condemnation in legal threats against Netflix and other platforms that were showing the documentary. The American Dental Association, ADA, American Association of endodontist and American Dental research Association said take it down so they took it down immediately. If there was really something wrong with this documentary they should have refuted the facts. They should have ridiculed it. They should have shown where the documentary was wrong. Instead they just demanded it be taken down. Pretty fishy. The Ada is the same organization that gives us fluoride in our drinking water whether we want it or not and then tells us it’s great for us. This is the same organization that tells us that mercury fillings are okay to put into are teeth in our mouths and yet it is listed as a hazard by the FDA so the Ada no longer endorse is it. The health information Nazis have reared their ugly heads and they won this time. Netflix began carrying the film 1 January 2019, and it soon met opposition from the American Dental Association (ADA), American Association of Endodontists (AAE) and American Association of Dental Research (AADR). In a letter dated 29 January, the ADA, AAE and AADR wrote that continuing to host the film on their platform could harm the viewing public by spreading misinformation about safe medical treatments like root canals. hese associations also sent similar letters to Apple, Amazon and Vimeo, which also carried the film. As of this publication date, the film is still available for purchase or streaming on these three sites. Joe Rogan had Dr. Shawn Baker on his podcast to discuss the carnivore diet. This is a diet where people only eat meat. People report losing weight and during their bodies of autoimmune disease. The question is weather this diet is healthy or not. I do not believe it is if you have to listen to anything I have said or written. The two greatest foods in the world are chlorella and spirulina in the best diet is a vegan raw food diet. An all meat diet is like the Atkins diet, just a diet that removes carbohydrates completely. This is not healthy since it throws the body into ketosis. Ketosis is not healthy. Joe Rogan is a former MMA announcer and Famous for his career in mixed martial arts. He now runs a podcast called the Joe Rogan Experience which is one of the most popular podcast in the world. He had Mikhaila Peterson on his show talking bout the Carnivore Diet. Pharmaceutical drugs exist for one reason and that is not to make us healthier. That is the claim and that is the aim of the of the scientists that are hired to make drugs. But what is the real purpose of pharmaceuticals? Pharmaceuticals exist exclusively for one reason. Yes they control the symptoms of disease such as high blood pressure, but at what cost? Pharmaceuticals exist solely so we can continue to eat the foods that make us sick. That’s the bottom line. If you change your diet your body to heal itself of any disease.